Ed is now half way through an important year at school. It is his last year at Collège (secondary school) and he is working towards his Diplôme National du Brevet with written exams in June, which as well as course work and a week of work experience with oral presentation will all count towards his final grade. The next step will be Lycée and our recent weekends have been spent visiting local establishments and checking out their courses. The work experience or stage in French is always done in February and Ed’s was carried out a few weeks ago in a small printing company that has recently set up in our village. He thoroughly enjoyed the week he spent there and even got a lie-in compared to the time he has to be out to catch the school bus. I was also pleased as there was no need for me to taxi him to work every day. Oh how karma has bitten us back! A second optional stage was offered during the school holidays by the local chambre de metiers in the artisan trades. Ed was happy to take part and put down his choice as boulangerie/patisserie and if I’m honest I was a little bit jealous, there is nothing quite as French as learning where your daily baguette comes from. However, despite living two doors from our village boulangerie, Ed was allocated one a twenty-minute drive away and the work of a boulanger tends to be rather nocturnal. I know our local boulanger is up and working by 2.00am, however, as a minor it is forbidden to start work earlier than 6.00am, so that is what time Ed was required to be there. So for three days this week we were up and out just after 5.30am, oh joy, deep joy. It was so dark with not a light to be seen anywhere in our village as the streetlights are turned off between 11pm and 6am during the week. I always feel a little bit naughty like I’m breaking a curfew if I’m out and about out of hours and these morning runs were no exception. The only other signs of life we saw were owls, pussycats and hares in pairs, plus mice and toads crossing the roads. Ed’s three shifts of six and a half hours were busy ones and he was on his feet and working for the entire time, a boulanger is not a work-shy being. 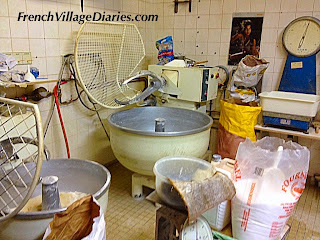 Over the three days he got to experience the bread making process plus croissants, almond croissants and pain au chocolats. He also helped with the patisseries, of which there was a much bigger selection than at our boulangerie. It has felt like a very long week, but we have survived, despite suffering from the worst cold I have ever experienced in my life and the lie-in this morning was bliss. Ed has been exhausted but has had a great insight into life behind the scenes at a boulangerie and although I’m not sure he has any passion for becoming a boulanger, it certainly hasn’t put him off eating bread or cakes.